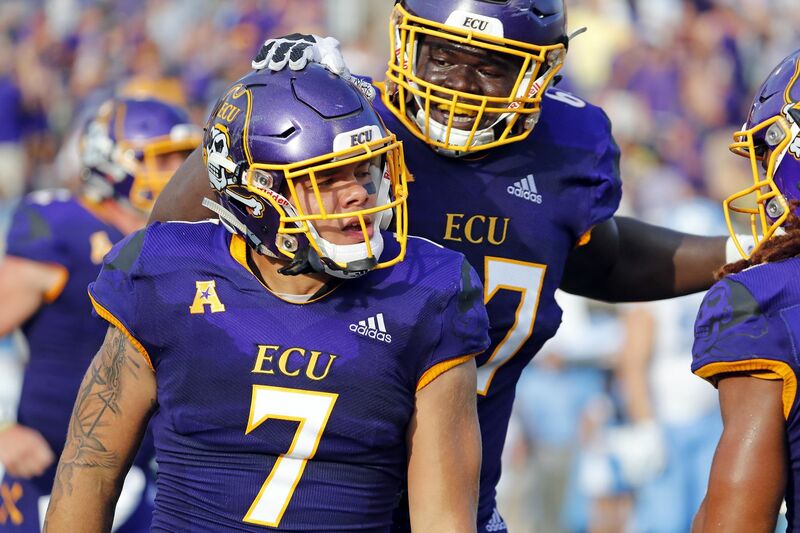 East Carolina running back Darius Pinnix (7) gets congratulated by teammate D'Ante Smith (67) during the second half of a game against North Carolina. On Sept. 8, the Pirates upset North Carolina, 41-19. The Sept. 15 game at Virginia Tech was postponed because of Hurricane Florence. On Sept. 12, the Pirates, whose campus is in Greenville, N.C., relocated to Tampa, where they are to play South Florida at 8 Saturday night in the American Athletic Conference opener for both teams. "A decision was made to relocate the East Carolina University football team to Orlando by bus early [Sept. 12] morning," the school's sports information department said in a statement. "The location was determined based on the track of Hurricane Florence and lodging availability, along with lessons learned from recent past difficulties returning home to an area impacted by widespread flooding. Should this be the case again as forecasted, accessibility and transitional logistics for our next game in Tampa become manageable." So ECU has been practicing in Florida and preparing to face the 3-0 Bulls, who have wins over ACC (Georgia Tech) and Big Ten (Illinois) teams over the past two weeks. "We are dealing with a lot of issues, of course, with some of our players and their families as we recruit our area very hard," ECU coach Scottie Montgomery said during Monday's AAC media call. "It has been great to be with each other and connected and surrounded by each other and our teammates. Just the love and brotherhood, the family that goes with being with each other in these difficult times." Houston scored 49 points last week and still lost by two touchdowns. The Cougars were defeated, 63-49, at Texas Tech. "I think we are a damn good football team, who didn't play well," Houston coach Major Applewhite said during the AAC media call. "We are still the same football team who had a phenomenal game" the previous week — a 45-18 home win over Arizona. Texas Tech had 704 yards of offense and quarterback Alan Bowman threw five touchdown passes and no interceptions. At least on one side of the ball, the Cougars played well. Junior D'Eriq King completed 30 of 51 passes for 431 yards and five touchdowns, also adding a rushing score. Temple's 35-14 win over Maryland moved the Owls from 11th last week to seventh in this week's AAC power rankings, in a vote among media members. 1. Central Florida (2-0), 2. South Florida (3-0), 3. Houston (2-1), 4. Cincinnati (3-0), 5. Navy (2-1), 6. Memphis (2-1), 7. Temple (1-2), 8. East Carolina (1-1), 9. Tulane (1-2), 10. Tulsa (1-2), 11. SMU (0-3), 12. UConn (1-2).